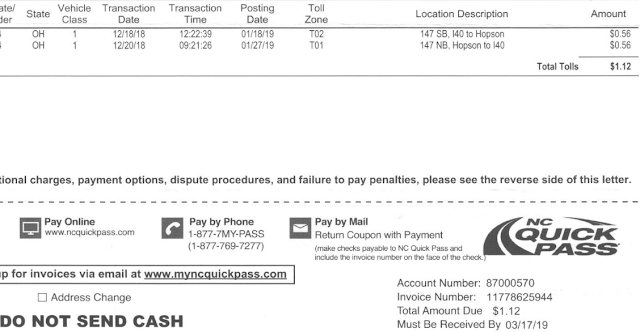 After a road trip, if you get a bill for an unpaid toll, perhaps you've encountered a "stealth" toll booth. During a trip late last year to North Carolina, I saw toll signs but never saw a toll booth, so I thought I just misinterpreted what I saw and just forgot about it. A few months later I get a bill from NC Quick Pass for $1.12 and it took me awhile to figure out what it was for, as I knew I didn't run a toll booth. Since the location was included on the bill, I used Google Street View to go find the toll booth and after going back and forth several times I finally figured out it. I had never seen this type of toll "arch" before and I certainly hope they don't become popular. You can see it for yourself at the link below. One more reason to love Dayton, Ohio.